Emiliano Niro was born in Rome on the 30th of April 1979. At 9 years old he began playing drums with a DIY kit attempting to play the most popular songs of Queen. After a period playing in various rehearsal rooms, at 18 years old he formed his first band Seven-Twelve, which performed sporadically in various local clubs. At 19, he bought his first drum kit, and joined the band Violent Key, which performed at Alkatraz (Fiumicino, Rome, Italy) and the Villaggio Globale in Rome. In 2001, Emiliano decided to rely on a teacher to acquire the knowledge needed to play his instrument properly. until 2005, when he joined Reapter. Emiliano is constantly looking for a heavy and yet versatile sound. 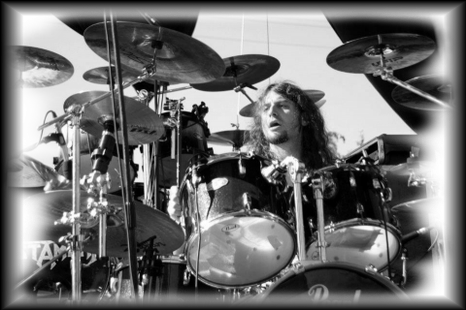 His drumming influences are Vinnie Paul (Pantera), Mike Portnoy (Dream Theater), John Bonham (Led Zeppelin) and Igor Cavalera (Sepultura). Among his favorite bands are Dream Theater, Metallica, Megadeth, Sepultura, Pink Floyd, Led Zeppelin, Rammstein,IronMaiden and System of a Down. In his spare time Emiliano dedicates himself to the study of the instrument (especially dedicated to the development of speed on the kick-drum pedal).